Other people out there might try to be emotionally manipulative in order to get you to share something. Instead, I’ve simply and respectfully asked that you share it, and kindness is a virtue. So by sharing it, you are demonstrating that you, too, are kind. 2. It will make you a better person. When you share something like “How to be a better parent,” you are stating that you, in fact, are that better parent, and the article you’ve discovered is affirmation that you’re doing the right thing. This, too, works in the same principle, because I’m saying everyone who shares this article is a better person, and you are sharing it, therefore your friends will know that you are a better person than them (unless they also share it). 3. It’s good time management. Reading long articles about Syria or Malaysian planes or whatever is in the news these days takes time. A list gives you the information you need to know, quickly, such as which Walking Dead character you are. You’ve been thinking to yourself, “What can I do for Dr. Matt lately?” The answer is: share this article. 5. You don’t like me. 6. You cannot be manipulated. 7. Your friends have already shared this. You like your friends. Therefore, it makes sense that what’s important to them is something you should at least consider being important to you, too. Plus, they’ll see that you shared it from their Facebook page, and that will bring a smile to their face, as they see that you care about them. Basically, sharing this article is like buying someone flowers. 8. 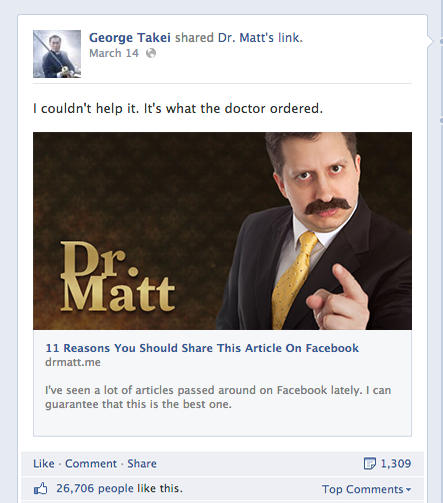 You can get the jump on George Takei. There’s no reason that you can’t also be a trend setter, and have the satisfaction of sharing something just before Takei does. Babies love it. You should too. 10. You are smart and attractive. I’m sure you already know this about yourself, but I just wanted to re-affirm it. There’s just something about you, and I think you really owe it to the world to share more of yourself more often. Also, this article. 11. This list goes to 11. You’ve shared some lists that go to 10. This is one better.